It’s no surprise that there’s a lot of great seafood in the Pacific Northwest. Since moving here over 3 years ago, I’m constantly reminded how spoiled we are. The fresh fish at Pike Place Market is well-known and restaurants in town have a lot of delicious seafood on their menu – rockfish, crab, mussels, oysters, sushi, and just about anything else you can want – I love that we have so many great options! One of my favorites is the crab cakes at Etta’s and Evan loves the blackened salmon sandwich at FareStart. After trying so many amazing dishes at restaurants, I get inspired to try to recreate some of them at home. I’ve made salmon cakes a few times now (Giada’s recipe is my go-to, but I tend to modify it), and even though they aren’t quite the same as Etta’s crab cakes, they are easy and cheap to make, and they taste great! 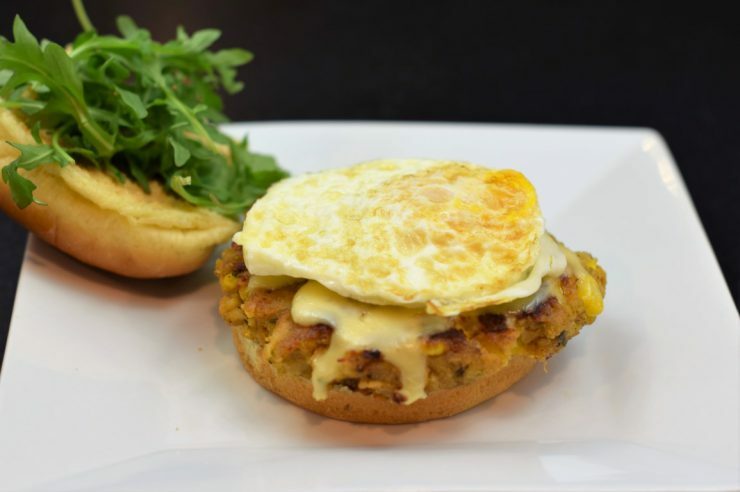 Recently, I decided to make my usual salmon cake recipe, but instead of serving them as a cake, I made them into burgers, topping them with an over-medium egg. I used canned salmon because I had some on hand, but next time I’ll probably buy some fresh salmon and use it in this recipe. 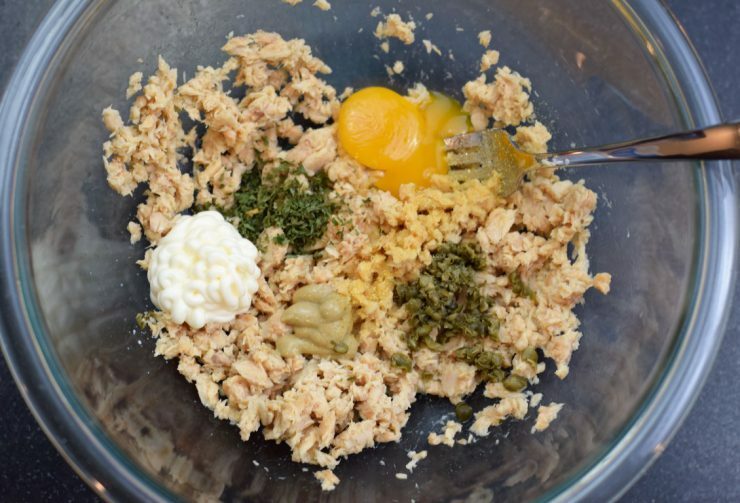 To make the salmon cakes, mix the salmon in a small bowl with an egg yolk, mayonnaise, mustard, lemon juice, diced capers, garlic powder, and parsley. Mix in the corn and bread crumbs. Stir until combined. The mixture will be sticky, but the breadcrumbs will bind it together and allow you to form the mixture into patties. Add additional breadcrumbs as needed. Divide the mixture in two and form each half into a patty, about 3 inches wide and 1/2 inch thick. Heat butter in a wide skillet over medium heat. Add the patties and cook about 5-7 each side, until lightly browned and the inside is cooked through. While the salmon cakes are cooking, fry two eggs. I like mine over-medium for this dish, but cook them to your preferred level of doneness. When the salmon cakes are just about done, add a slice of Gouda cheese on top, cover the pan, and let the cheese melt for about 1 minute. I like using Gouda because it has a nice, mild flavor, but feel free to use any cheese you like. Or omit it if you prefer! To assemble the burgers, add about 1 tablespoon of sriracha mayonnaise to the bun. 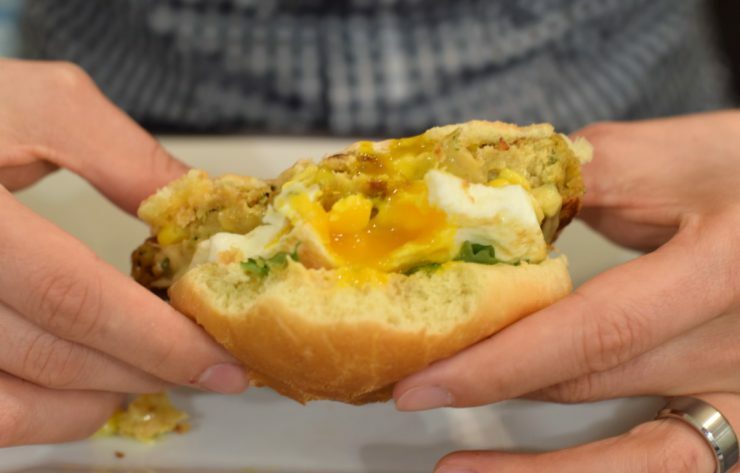 You can make sriracha mayonnaise easily by just adding sriracha to mayonnaise. I added about 1 to 2 teaspoons to about 2 tablespoons of mayonnaise, but if you love sriracha and spice, add as much as you like. 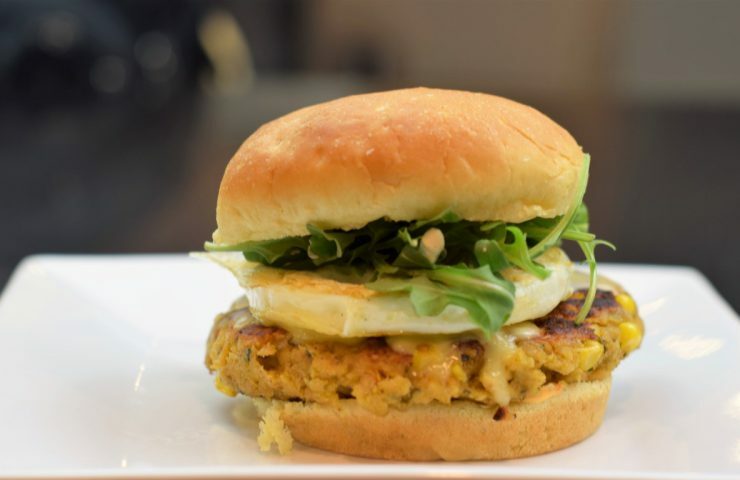 Add the salmon cake to the bun, layer on the egg, and top with fresh arugula. Enjoy immediately! 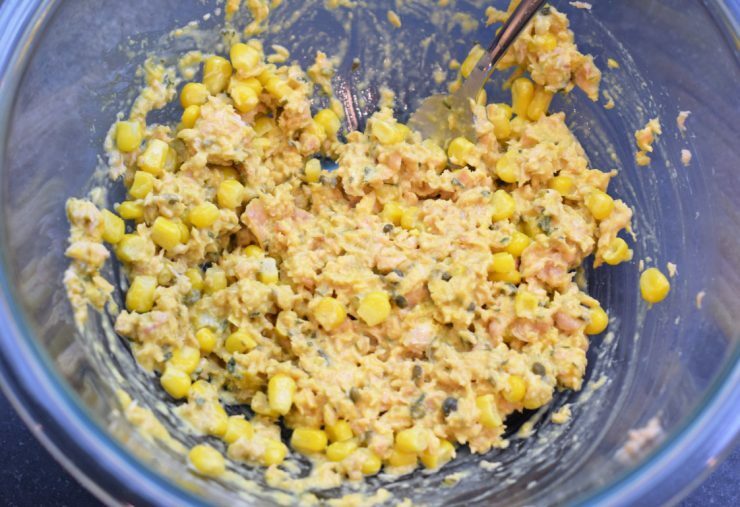 Prepare the salmon cakes by mixing salmon with an egg yolk, mayonnaise, mustard, lemon juice, diced capers, garlic powder, and parsley in a small bowl. Mix in the corn and bread crumbs, and stir until combined. 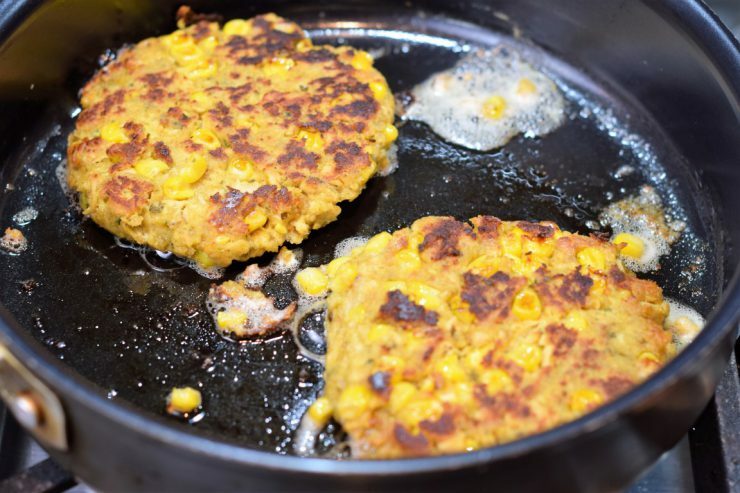 The mixture will be sticky, but the breadcrumbs will bind it together and allow you to form patties. Add additional breadcrumbs as needed. Divide the mixture in half and form into patties, about 3 inches wide by 1/2 inch thick. Heat butter in a wide skillet over medium heat. Add the patties to the pan and cook about 5 to 7 minutes each side, until lightly browned and the inside is fully cooked through. While the salmon cakes are cooking, fry two eggs in a small frying pan. I like mine over-medium, but cook them to your preferred level of doneness. 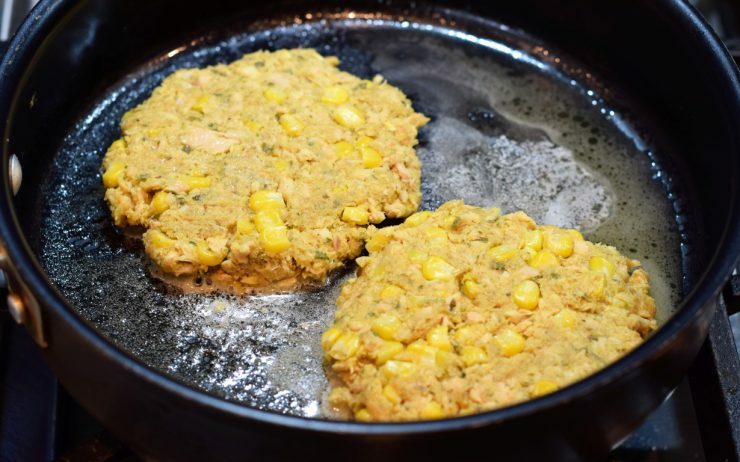 When the salmon cakes are just about done, add a slice of Gouda cheese to each patty, then cover the pan and let the cheese melt, about 1 minute. To assemble the burgers, add 1 tbsp sriracha mayonnaise to each bun. 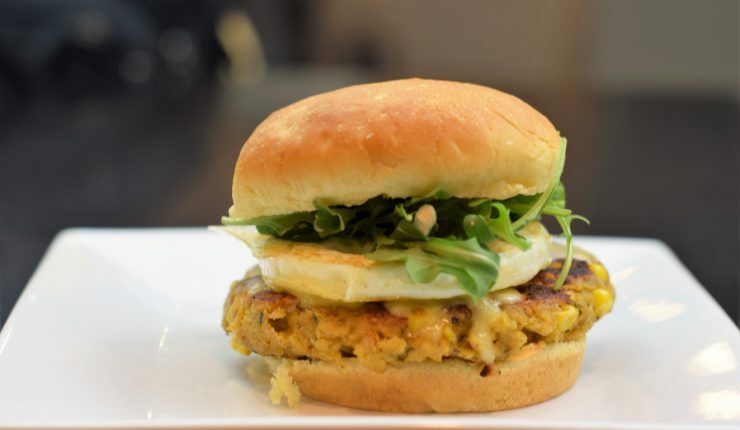 Add the salmon cake, layer on the egg, and top with fresh arugula. Sriracha mayonnaise can be easily made my mixing about 1 to 2 tsp of sriracha with about 2 tbsp mayonnaise.